KIEV, Ukraine --Protesters on Friday seized a government building in the Ukrainian capital while also maintaining their siege of several governors' offices in the country's west, raising the pressure on the government. After meeting with President Viktor Yanukovych for several hours late Thursday, opposition leaders told the crowds that he had promised to ensure the release of dozens of protesters detained after clashes with police, and stop further detentions. They urged the protesters to maintain a shaky truce following violent street battles in the capital, but were booed by demonstrators eager to resume clashes with police. The truce has held, but early Friday protesters broke into the downtown building of the Ministry of Agricultural Policy, meeting no resistance. "We need to keep people warm in the frost," said one of the protesters, Andriy Moiseenko. "We cannot have people sleeping in tents all the time." The demonstrators allowed ministry workers to take their possessions, but wouldn't allow them to go to work. The move followed the seizure of local governors' offices in several western regions on Thursday. In reaction to the ongoing violence, the U.S. State Department has already pulled the visas of several people deemed responsible for the government's actions, but White House spokesman Jay Carney would not say Thursday whether the Obama administration believes Yanukovych will step down to end the crisis. Carney issued a threat of further sanctions when asked about the deteriorating situation in Ukraine, and said that the "increasing tension" was a "direct consequence of the government failing to acknowledge the legitimate grievances of the people." He said the U.S. would consider "additional steps" in response, including sanctions. "We support an end to the violence. We support a dialogue between the government and the opposition movement," he told reporters. "And we will, obviously, as the situation evolves, consider other steps." In Lviv, near the Polish border, some 280 miles west of Kiev, hundreds of activists burst into the office of the regional governor, Oleh Salo, a Yanukovych appointee, shouting "Revolution!" They forced a local governor to sign a resignation letter and remained in the building, refusing to let the workers in. 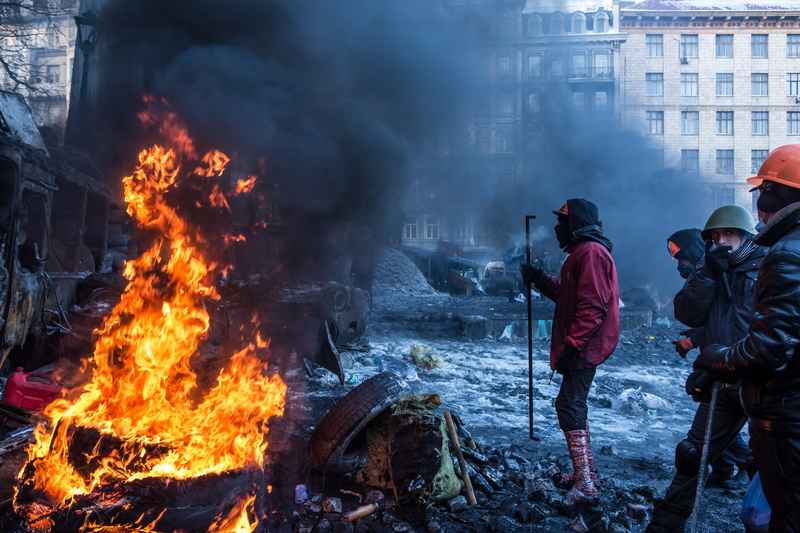 Is violence in Ukraine spiraling out of control? Protesters also have retained control of offices in four other western cities seized Thursday, though they suffered a setback in Cherkasy, about 90 miles southeast of Kiev, where police barricaded the governor's building from inside and prevented them from taking control. Police reinforcements arrived later, dispersing the protesters and arresting several dozen of them. Germany has summoned Ukraine's ambassador in Berlin to demand an end to the government's use of force against protestors, a spokesman for the foreign ministry said on Friday. "The aim of this summons is to make clear to Ukraine's official representative in Germany what the position of the German government is," said spokesman Martin Schaefer, adding that Berlin was seeking an end to recent violence and a re-examination of sweeping anti-protest legislation. "We expect Ukraine's ambassador to pass on this message without delay to his government, the president and the prime minister." Yanukovych, meanwhile, called an emergency session of parliament - which is controlled by his loyalists - next week to discuss the tensions. It wasn't clear if Yanukovych's move Thursday reflected his intention to bow to some of the protesters' demands, or was just an attempt to buy some time and try to ease tensions. His Interior Minister Vitali Zakharchenko issued a statement late Thursday guaranteeing that police would not take action against the large protest camp on Independence Square, known as the Maidan. He also urged police not to react to provocations. The demonstrations began two months ago after Yanukovych abruptly ditched an association agreement with the European Union in favor of a bailout loan from Russia. The protests have been largely peaceful, but they turned violent Sunday after Yanukovych pushed through harsh anti-protest laws and stonewalled protesters' demands that he call new elections. Two people were fatally shot in the clashes Wednesday, the first deaths since the protest began, fueling fears of further escalation. The opposition has blamed the deaths on authorities, but Prime Minister Mykola Azarov said Thursday that the two men's wounds were caused by hunting rifles, which the police do not possess. The opposition claimed that as many as five protesters were killed in Wednesday's clashes, though they said they have no evidence because the bodies were removed by authorities. Opposition leaders had earlier set a Thursday evening deadline for the government to make concessions or face renewed clashes, but then pleaded with the crowds to extend the truce, even though the talks with Yanukovych brought little visible progress and there was no word about meeting the main protesters' demand for early elections.